Welcome to The Gingham Grasshopper's new blog! This is where we will be posting all the events and happenings going on at The Gingham Grasshopper. We will give you sneak previews of new items such as baby bracelets or Christening gifts that will be available in our store (so you will get the first look!) We will also keep you informed of any sales events or coupons that our store is running. So be sure to check in often to see what is happening! And if you have some new items you would like to see, just let us know. A new baby and children's bracelet we will have soon is "Alluring". 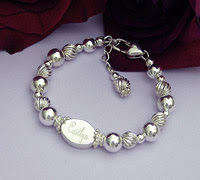 This is an all sterling silver bracelet with an engraved medallion. The medallion is small and will look best with names that are 6 letters or less. The engraving is done in an upright script. It will be available in sizes 4 inchs - 6.5 inches, and of course, it comes with a free 1/2 inch extender. 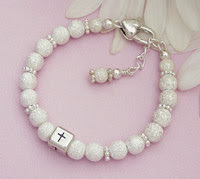 Also, we will have a new Christening or Baptism bracelet, "Sweet Stardust". So many customers have loved our "Silver Shimmer" bracelet made with white freshwater pearls and stardust beads, that we thought we would see if a Christening bracelet made entirely with stardust beads would be as popular. This little bracelet has a rounded cross bead as the focal point of the design. P.S. For all of you attorneys following-- we will have some new jewelry coming for you, too. Plus, our first brooch in a design made just for lawyers!